With signups closing in the next hour or so, I wanted to make a post with more information regarding Week 1, Pre Week 1 Seedings, and what not. Seedings are not important until Playoffs as they do not dictate anything until then. This however does not mean you will get in with 8 losses. The criteria to get into Playoffs is documented further on the Rules page. The TLDR version is Wins / Losses along with some other criteria. Matches for Week 1 are generated Sunday morning. To start organizing your matches, you will need to use Match Comms, and put screenshots of any communications that pertain to the match details, from other chat clients, in the Match Comms as well. With Week 1 just a few days away, we want to reassure you that we are committed to doing anything and everything in our power and ability to solve any issues in a timely manner. If you find / have an issue, please send it through the #support channel, or to an Administrator. We want to remind you that some of this is new to us, and as such we ask that you are patient when trying to organize or resolve anything. Finally, if you want a 30 Mumble server to be used for anything, not just teams, or you don't like Discord much, we are providing 30 slot Mumble servers on a dedicated box for $3.50/month through our Patreon. This works as a subscription based service, and also helps support running costs of the league. Since it is a subscription service, if the subscription is cancelled the server is unassigned, no data or content is lost, as we do not reuse servers. Finally, we are part of the way through having the badges added to the game, we have received a response and are being advised as to what we need to do to assign badges to participants after they are added to the game. 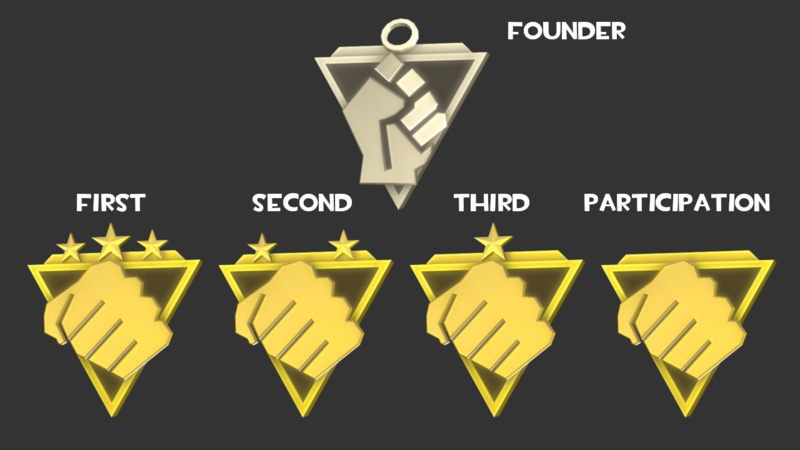 With this in mind, I would like to announce the Respawn League Founder's Badge. This badge is given out to everyone who participates in Season 1 of Highlander, for both regions. This means that Asia will get the badge in their first season, along with the other badges.